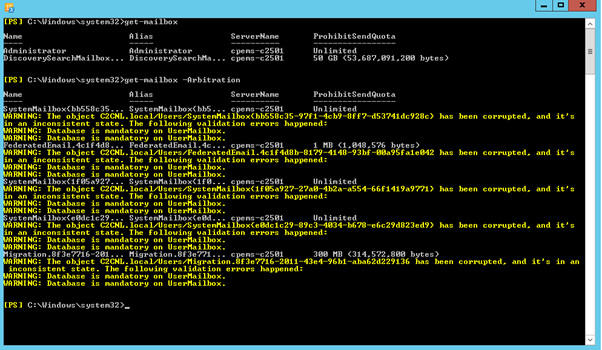 The Microsoft Exchange Replication service does not appear to be running. Last week we had a major outage in our Exchange 2010 environment (28 multi-role servers in 2 DAGs). The provisioning system (based on Quest software) did some unexpected things after a restore of the provisioning database, resulting in (lots of) security groups in Active Directory being deleted. We were relatively lucky since the default groups (Domain Admins, Enterprise Admins etc.) were not deleted, but all Exchange Security Groups (in OU=Microsoft Exchange Security Group) were deleted. These Exchange Security Groups can be recreated using the Setup.com /PrepareAD and Setup.com /PrepareDomain commands. The Microsoft Exchange Replication service does not appear to be running on “computername”. Make sure the server is operating, and that the services can be queried remotely. Exchange 2016 – What’s new? Now that Microsoft has Exchange Server 2016 it’s time to have a closer look at what’s new in the product. It might not be a surprise that it looks a lot like Exchange Online. Not surprisingly since Microsoft is developing Exchange for the cloud, and Exchange on-premises is just a spin-off of Exchange Online, released on a quarterly basis. It might be blunt to say, but Exchange 2016 is nothing more than Exchange 2013 Service Pack 2, if you look at the version numbering with PowerShell (Get-ExchangeServer | Select Name,AdminDisplayVersion) you’ll see that it’s actually a minor upgrade from 15.0 (Exchange 2013) to 15.1 (Exchange 2016). The question can be raised why a new version? It’s all about the support lifecycle, and get rid of support for Exchange Server 2007. Customers need a new version, from a support point of view or from a license point of view (software assurance). But, back to Exchange 2016… it is a new version, and with a new version also new features are introduced and other features are deprecated or removed.